YogaFest is a deeply nourishing, highly joyful, and spiritually authentic four-day celebration of spirit, nature, community, service, and all things yoga. It is an immersive experience into your innermost bliss which offers ample, almost endless opportunities for exploring, experiencing, and living in attunement with your deeper spiritual nature. From quiet reflection in a serene natural environment to active movement in a vibrant and energetic atmosphere; from camping with friends and family to participating in a full and exciting slate of programs morning, day, and night - there is something for every sincere seeker of truth at YogaFest 2019. A partial list of what you can expect to encounter includes hatha, bhakti, jnana, kundalini, raja, and flow yoga classes; meditation, kirtan (sacred music), workshops, hiking, camping, swimming, healing, art, music, dance, children’s programming, sacred ceremony, merchants, vendors, festivities, sustainability, mindfulness practices, spiritual discussions, and much, much more. It is a deeply inclusive, deeply devotional, deeply authentic celebration of spiritual truth. YogaFest is held at Song of the Morning Yoga Retreat in the northern woods of Michigan’s lower peninsula (12 miles east of Vanderbilt off I-75 exit 290). To learn more about Song of the Morning, a year-round spiritual sanctuary for all truth thirsty souls, please visit our website. To get to the retreat, please follow these directions. It’s pretty straightforward to get here, but GPS will sometimes lead you astray so make sure to follow the directions on our website, and don’t turn on a dirt road unless you see the Song of the Morning sign (pictured top right). YogaFest 2019 will be held from Thurs. July 25 - Sun. July 28, 2019. Full festival passes and day passes are available at an extremely reasonable rate on our ticket purchase page. Teenagers are invited at half the adult price, and children 12 and under get in for free! Everyone! Every sincere seeker of truth of every age and ability is welcome at YogaFest 2019! From children through seniors, all will find specific programming suited to his or her constitution, not to mention plentiful opportunities to commune with like-minded and open-hearted people in a joyous and uplifting environment. YogaFest is a family-friendly event in which all are invited, and all are made to feel truly welcome. We have classes such as chair yoga and gentle movement for those who might be limited in motion, as well as vigorous acrobatic yoga and power yoga classes for the more adventurous among us. There are workshops and discussions of beginner, intermediate, and advanced levels covering subjects ranging from the esoteric to the universal. And YogaFest is an alcohol and drug free festival held at a year-round spiritual retreat, making it a wonderful opportunity for families to come closer together in a highly conscious environment. To foster this familial atmosphere and experience, teenagers are invited at half the adult price, and children 12 and under get in for free! We welcome all with love in their hearts to join us in celebrating the unity of divine spirit as it manifests through the vast diversity of all creations. What will there be for kids to do at YogaFest? Lots! YogaFest offers an immersive, exciting, and bountiful experience for kids of all ages, with 800 woodland acres to explore on and around the Pigeon River, and family programming throughout much of the weekend! We will update you with more specifics as the festival gets closer, but we hope to bring back everything that has made past festivals such an incredible opportunity for children and families, including the Youth Tent, the Family Forest Village, and the Circus of Wonder. In the Youth Tent you will find programs geared towards all youth - from toddlers through teenagers, from facepainting to fun and engaging kid-focused yoga classes. 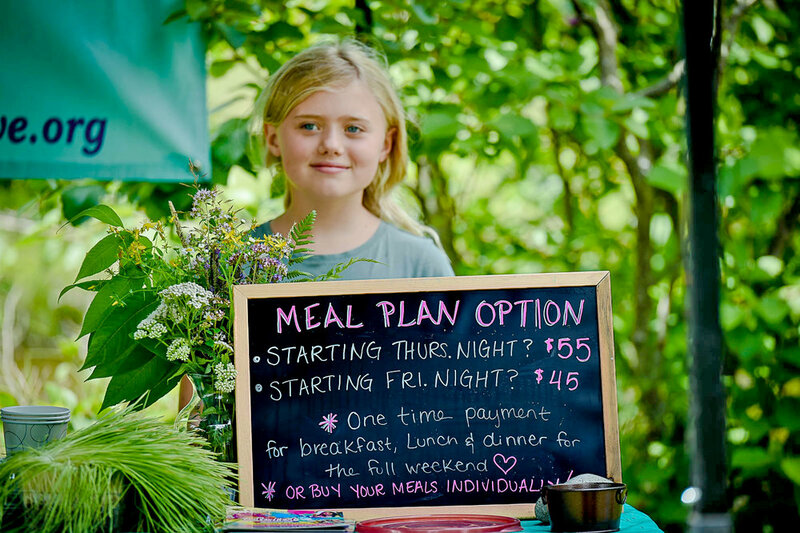 Forest Village is a very special gathering place and slate of programming which invites children and families to participate in an engaging hands-on nature immersion. The Circus of Wonder was a wildly popular, colorful, and interactive exploration of art, creativity, spirit and nature full of play and delight. View last year’s program schedule to get a good idea of how children of all ages are invited to explore and experience YogaFest in a magical way, and for families to come together in beautiful connection. All of this is offered in a safe, family-friendly environment that is highly conscious, extremely friendly, and drug and alcohol free. We are happy to invite children 12 and under to attend the festival FREE with a paying adult; and offer teenagers 13 - 17 tickets at HALF PRICE. Tickets will be made available early in 2019. AN IMPORTANT NOTE: while we look forward to creating and upholding a positive, safe space for all who attend, your children are your responsibility. It is imperative that parents chaperone their children at all times unless the young ones are enrolled in a supervised activity where it is clearly communicated to all involved parties that the kids will be looked after by the facilitator(s). We will have a waiver for you to sign, and some basic safety protocol in place when you arrive on site with your young one(s). All full festival passes include complimentary camping for Thursday, Friday, and Saturday nights on Song of the Morning’s property. However, day passes DO NOT include camping privileges. If you are coming up for the day, or even if you have purchased multiple day passes, you will need to make arrangements to stay offsite. Camping privileges are for Full Festival Pass holders only. There is a public National Forest campground just down the road from Song of the Morning Yoga Retreat, a few accommodations which may be available in or around Vanderbilt (the nearest town, approximately ten miles down the road), and a number of hotels in Gaylord (about a half hour drive from festival grounds). If you need specific directions to the public campground, or are interested in the Vanderbilt sleeping options, please submit an inquiry on our contact page. There are also a few on-site indoor accommodations left, which can be booked for an additional fee by clicking here. As you arrive, our friendly campground staff will direct you to a campsite, which will be assigned on a first-come first-served basis (taking into account your needs, preferences, party size, etc.) We do not have the capacity to take campsite reservations, so if you want to camp with someone, please arrive with them. After you have unloaded your belongings at your campsite, you will be directed to where to park your vehicle. For safety, environmental concerns, organizational capacity, fairness, to comply with health department requirements and state law, and for the overall good of the festival - including serenity and spiritual integrity - you will not be allowed to park your car at your campsite, but rather in designated parking lots. Most parking will be a comfortable walking distance to the festival, but a shuttle will be available to assist as needed with transportation to and from the parking areas. Because you will not be parking next to your campsite, we recommend bringing a cooler with an airtight lid to store food. Animals should not be too much of a problem, but we are a rustic festival out in the woods, so we can make no guarantees regarding wildlife. Please NO CAMPFIRES. Small cookstoves are OK, but please be mindful of them at all times. Camping is rustic - meaning you will get a cleared space in the woods a short walk from the central festival grounds. There are no campsite amenities, however there is a nice warm-water shower pavilion free to all, as well as porta-potties and a central water station for refilling your water bottle. You are welcome to bring your camper. We can accommodate almost all campers and RVs, however no water, electricity, or sewage hookups will be available. Also, in order to maintain a reverential space conducive to peace, quiet, and a spiritual immersion in a serene natural environment, we ask that you do not run your generator during the festival. YogaFest is a rustic and peaceful event. No. Sorry. No pets allowed. There will be vegetarian, vegan and gluten-free food on-site, including food options from the Song of the Morning Ranch Kitchen, and full weekend meal plans starting at a very reasonable $45 from the Harmony Collective of Ypsilanti. Other Michigan vendors will be on-hand selling their wares, including the return of Sacred Springs Kombucha and My Little Honey Pot. Additionally, you are welcome to bring your own food to enjoy, however for reasons of safety we can not allow campfires on Song of the Morning grounds. Small camping stoves are permitted, but keep in mind that campsites are primitive and no electricity will be available. The last chance to pick up ice is in Vanderbilt, about 12 miles down the road. Please do not bring glass, especially onto the central festival grounds. We strive to make this a barefoot-friendly event. Rain or shine, the festival is on! We expect about 600 people on site for YogaFest 2019; which is big enough to feel like a vibrant community, but not so big as to feel impersonal. The 800 woodland acres of Song of the Morning Yoga Retreat absorb the influx of people gracefully. We have heard YogaFest described as a festival for people who don't like festivals; insomuch as there is a serenity to the experience that is rejuvenating rather than depleting. What are the things I should do, and not do, at this festival? Bring a re-usable water bottle, and extra water. Drinking water stations will be posted around the central festival grounds, but it is a good idea to bring your own modest water supply as well, as no water is provided in or around the campsites. Bring a bicycle, if you want to. It’s by no means necessary, but can be nice in getting back and forth from your campsite to the Yoga Tent, and elsewhere. We are a bike-friendly event. Bring a re-usable plate and utensils. To cut down on waste, we encourage everyone to bring reusable kitchenware. There will be wash stations for your use. Thank you for doing your part to keep our ecological footprint to a minimum through conscious efforts of reusing, reducing, and recycling. Be self-sufficient. While we will do our best to provide a supportive atmosphere, we ask that you be self-initiating and self-reliant in all ways. For four days we are a community, and as a member of the YogaFest community you are empowered and encouraged to take ownership of it; to do what needs to be done in order to make it a home for yourself and for others. Bring your pet. NO pets allowed on retreat grounds. Start a fire. Because of risk of wildfire, NO open-flame campfires are permitted at YogaFest 2019. Small cookstoves are OK, but please be mindful of them at all times. Bring or consume tobacco, drugs, or alcohol. NO intoxicants of any kind are permitted on Song of the Morning grounds (unless you include coffee, which will be available). This is a conscious celebration in line with traditional yogic values of health and wholeness. It is not an unconscious party. If that is what you are looking for, there are numerous options at your disposal and we humbly suggest you look elsewhere. Please respect the spirit and intent of our sacred devotional festival. Run a generator. In order to maintain the integrity of a serene and reverential space, NO generators are allowed. YogaFest is a quiet and rustic festival which invites you to cozy up to mother nature in all of her elemental glory. Cell service has gotten better in recent years, however we are a rustic retreat in a remote location and cell phone coverage can still be spotty. We cannot guarantee that your cell phone will receive service. That said, most of the time you will be able to find pockets of modest coverage scattered here and there across festival grounds. We also have a charging station for your phone located near the Main Tent. All of that being as it is: we invite you to unplug and re-connect with yourself and the immediate YogaFest community which surrounds you. We encourage you to view attending to your soul nature - and not to the pull of the world - as the highest priority during your time at the festival. There will be limited wireless internet available at select and centralized locations. Our top priority is to ensure connectivity for YogaFest vendors; with any remaining capacity then being made available for general use by festival attendees, presenters, and volunteers. This means that we cannot guarantee unlimited WiFi for general use - and again we invite you unplug from your device and reconnect with yourself and the greater YogaFest community - but we will do our best to keep the internet up and running. YogaFest is a Pack-it-in Pack-it-out event. If it came in with you it should leave with you. YogaFest is a deeply spiritual festival and we are serious about honoring yogic principles. No alcohol. No drugs. No tobacco. Period. We ask that while you are here you respect your body, your heart, your mind, your spirit, and your neighbor with equal reverence, love and joy. YogaFest belongs to all of us and is what we make of it. Please approach every element of the festival, including everyone you meet, in a spirit of compassionate kindness, thinking about how you yourself would like to be treated. Kindness goes a long way, and if you see something that needs doing, do it. Sounds great. How do I get involved? There are many ways! You can of course purchase a ticket when they go on sale approximately February 1st. Or if you are called to greater involvement, we are an all-volunteer festival and encourage you to submit an application to be a presenter, vendor, healer, or sponsor. Applications will be opened up very early in the new year, where they will be found under the Get Involved tab at the top of every YogaFest web page. Is there anything I can do to help make this festival green and sustainable? Yes! You can bring a reusable plate and utensils, and a reusable water bottle, in order to help cut down on waste. There will be wash stations conveniently located near the food court for your use. You can also help us by keeping track of your - and any other - garbage, compost and recyclables you see; and make sure everything gets sorted as it should. We will have designated compost/trash/recylcing station to use, but you will likely want something to transport waste generated from your campsite. Thank you for doing your part in keeping our ecological footprint to a minimum through conscious efforts of reusing, reducing, and recycling. What if I can’t afford a ticket? We are pleased to offer a volunteer ticket exchange program for YogaFest 2019. A ticket exchange volunteer receives a full festival pass in exchange for working 15 hours during (or in some cases before or after) the festival. As with all full festival passes, camping access is included with the ticket, and it is a wonderful opportunity to be a part of the YogaFest team and experience the festival from the inside-out. If for any reason you are not able to fulfill the ticket exchange volunteer requirements, we also have scholarships available on an as-needed basis. Please call or email us if you are interested in applying for a scholarship. To apply to serve and enjoy the festival as a ticket exchange volunteer, fill out this form. Sorry, no. Once purchased, tickets are non-refundable. There is something I still don’t understand. Where can I get more information? If you have a question that has not been answered on this page, you can email YogaFest Coordinator Brian Clark by using the form at the right, or by clicking here. You can also call Song of the Morning Yoga Retreat at 989.983.4107. We try to answer the phones during office hours, which are Tuesday through Saturday from 10-4 Eastern Time. The Song of the Morning sign (in brown) is up all year round, welcoming you to our "yoga retreat of excellence." The blue YogaFest sign will be up during the week of the festival to help notify and guide you in the right direction. Both signs will be on your right as you are driving on Sturgeon Valley Road, about ten miles east of Vanderbilt. Roy Thibodeau, a longtime member of the Song of the Morning community, leads a meditation program in the Lodge during YogaFest 2017. Rowena Conahan leads a pack of children across a bridge spanning the Pigeon River, as part of the interactive Family Forest Village program at YogaFest 2017. Happy campers enjoying the beautiful summer weather at YogaFest 2017. A young volunteer helps out at Krishna's Kitchen, a YogaFest staple eatery providing delicious vegetarian food that has been lovingly prepared by Harmony Collective Ypsilanti. Ria Nieboer leads an Open Heart Power Yoga class in the Yoga Tent at YogaFest 2017. 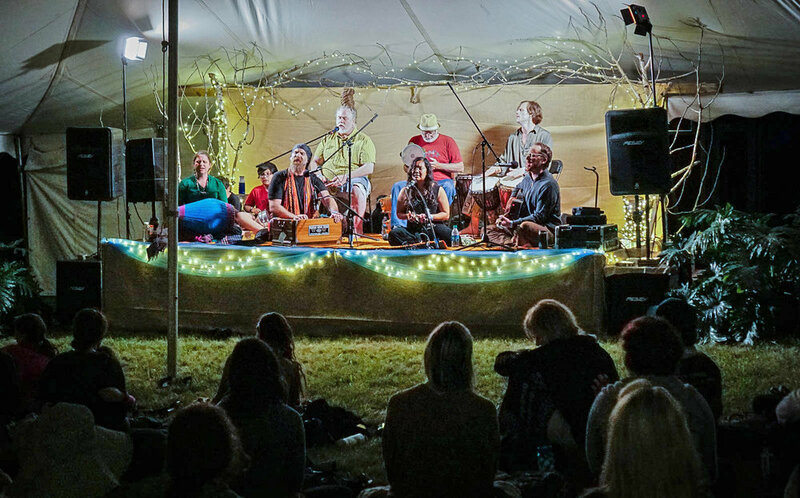 A spirited and soulful evening of Community Kirtan headlines the YogaFest Main Stage during opening night of YogaFest 2017. Naren Schreiner (foreground) and Swami Sankarananda (background) offer devotional prayers of gratitude and praise during YogaFest 2017. We are blessed to have these two sincere souls infuse the festival atmosphere with their deeply peaceful and supremely loving spirits, and are pleased to announce plans for both Naren and Swami to return for YogaFest 2018. YogaFest Coordinator Brian Clark (barefoot at the microphone) shares a laugh with Assistant Coordinator Justine Markey (standing), Mohinder Singh (in white) and Trevor Chaitanya (partially obscured) during a morning Seva Meeting at YogaFest 2017.